Alternately called Torso of a Dancing Girl this beautiful little figure was also carved twice in marble. Three bronze casts were made using the lost wax process and finished with a green patina. Presently one marble original is in the Concord Art Association, and one in the Farnsworth Museum in Rockland, Maine.one bronze is in the Museum of Fine Arts in Boston, one in The Metropolitan Museum of Art in New York City, and one in a private collection. It was originally exhibited at the Boston Art Club where it was so greatly appreciated that the members did it the honor of taking up a collection to purchase it. It was loaned by the club to the Guild of Boston Artists for the show that toured several major American museums in 1916 and later was exhibited at the St. Botolph Club in Boston. Reviews were glowing. 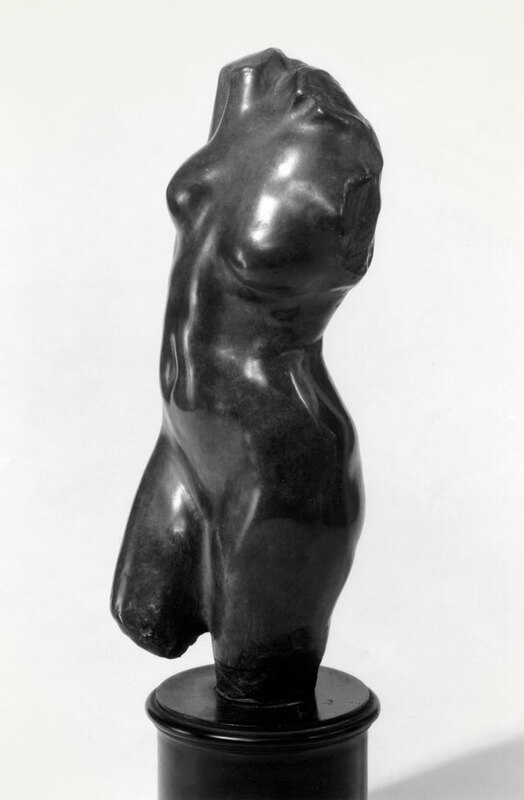 Allen was teaching at the Museum School at the time and with the torso was able to show artistic proportions in the human form without adding head and limbs, beauty without surface details to add interest, and dynamic movement without seeing the whole figure. Signed and dated on the back of the stump of the left leg. No foundry mark.